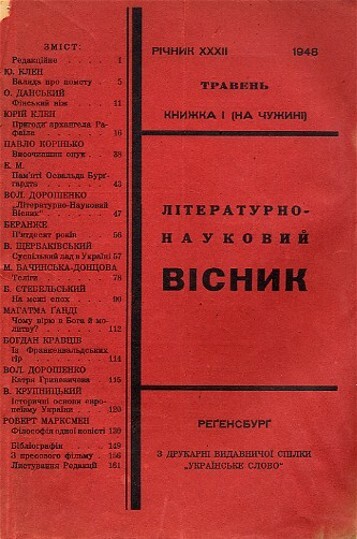 Literaturno-naukovyi vistnyk [«Літературно-науковий вістник»] (Literary Scientific Herald, or LNV). 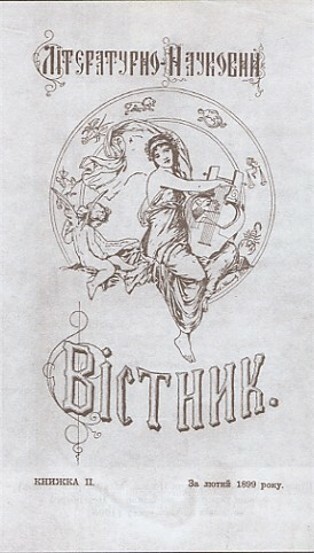 A monthly journal published in 1898–1906 in Lviv, in 1907–14 and 1917–19 in Kyiv, and in 1922–32 again in Lviv. It was founded on the initiative of Mykhailo Hrushevsky as the organ of the Shevchenko Scientific Society (NTSh), incorporating the journals Zoria (Lviv) (published by the NTSh) and Zhytie i slovo (published by O. Franko). From 1905 it was published by the Ukrainian-Ruthenian Publishing Company. LNV became the foremost literary-scientific journal of the day. The editorial board consisted of Mykhailo Hrushevsky (editor in chief), Ivan Franko, Oleksander Borkovsky, and Osyp Makovei. The latter two soon resigned and were replaced by Volodymyr Hnatiuk. The de facto editor during the first period of LNV in Lviv was Franko, who published a large number of his own poems, stories, and tales therein, as well as literary critiques, history articles, and reviews. He also obtained the collaboration of leading writers from all parts of Ukraine, including established writers, such as Hanna Barvinok, Oleksander Konysky, and Danylo Mordovets, and younger writers, such as Volodymyr Vynnychenko, Mykola Vorony, Borys Hrinchenko, Ivan Karpenko-Kary, Ahatanhel Krymsky, Volodymyr M. Leontovych, Volodymyr Samiilenko, Liudmyla Starytska-Cherniakhivska, Lesia Ukrainka, Katria Hrynevycheva, Petro Karmansky, Yu. Kmit, Bohdan Lepky, O. Makovei, Les Martovych, Vasyl Pachovsky, Vasyl Stefanyk, Marko Cheremshyna, Mykhailo Yatskiv, and Olha Kobylianska. After the Revolution of 1905, when publication in Ukrainian became possible in Russian-ruled Ukraine, Hrushevsky transferred LNV to Kyiv, where he took over the editorial responsibility and published his own belletristic works, signed ‘M.Z.’ (Mykhailo Zavoloka), publicistic articles, reports, and reviews. So that the circulation of LNV could be extended to Galicia and Bukovyna, the journal was sent in folio to Lviv, where it was then bound at the NTSh shop. Later the Lviv editorial office was created and managed by Mykola Yevshan. New contributors included Spyrydon Cherkasenko, Hrytsko Chuprynka, Denys Lukiianovych, Oleksander Hrushevsky, Mykola Zalizniak, Viacheslav Lypynsky, Andrii Nikovsky, Mykola Porsh, Valentyn Sadovsky, Mykola Stasiuk, Ivan Feshchenko-Chopivsky, Kostiantyn Shyrotsky, Volodymyr Doroshenko, Ivan Dzhydzhora, M. Yevshan, Yevhen Levytsky, Mykhailo Lozynsky, Mykhailo Mochulsky, and Lonhyn Tsehelsky. Until the beginning of the First World War LNV played an important part in uniting the cultural forces that had been separated in consequence of the division of Ukraine between the Russian Empire and Austro-Hungarian Empire. In 1914, like all Ukrainian press, LNV was banned. When the tsarist regime fell in 1917, the journal resumed publication under the editorship of Oleksander Hrushevsky. New contributors included Pavlo Tychyna, Maksym Rylsky, Yakiv Savchenko, and Mykhailo Ivchenko. Conditions in Kyiv, however, were unfavorable for its progress, and in 1920 LNV was again banned, this time by the Soviet authorities. In 1922 LNV was revived in Lviv with the financial support of former Sich Riflemen. The editorial committee consisted of Volodymyr Hnatiuk, Volodymyr Doroshenko, Mykhailo Halushchynsky, Yevhen Konovalets, Yulian Pavlykovsky, and Ivan A. Rakovsky, and was headed by Dmytro Dontsov. The idea behind the revival of LNV was to unite all the literary forces in Western Ukrainian territories and in the diaspora that defended a Ukrainian national standpoint. Former eminent contributors were followed by younger collaborators, such as Bohdan Ihor Antonych, Nataliia Livytska-Kholodna, Yevhen Malaniuk, Yurii Lypa, Bohdan Kravtsiv, Oleh Olzhych, and Oleksa Stefanovych. The editorial board, however, progressively ceased to function, and Dontsov, the editor in chief, caused a portion of the collaborators to quit because of his nationalistic ideological attitude. The declining artistic standard of the journal, combined with financial difficulties, caused LNV to cease publication at the end of 1932. Dontsov thereupon began publishing his own journal Vistnyk. In 1948–9 two more issues of LNV appeared in Regensburg, edited by V. Shulha. The first 20 volumes of LNV were catalogued by Vasyl Domanytsky in 1903. B. Yasinsky later (2000) compiled an index of the entire edition . A referral to this page is found in 78 entries.